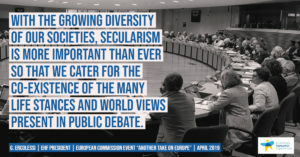 Brussels, 1 April 2019 – The European Humanist Federation advocated for a more humane Europe that truly aims to uphold the fundamental humanist values of freedom, equality and solidarity at the event Another Take on Europe organized in cooperation with the European Commission in the framework of its dialogue with non-confessional organisations. In 14 priorities, the EHF set out a vision for a society that truly cares for the human dignity of all its members and empowers them to make their own choices about their lives, free of any form of discrimination. The humanist worldview embraces the values of freedom, equality, solidarity and human dignity. Politically speaking, this translates in the necessity for the state, at local, national and European level to respect the fundamental principle of secularism, a necessary condition if we are serious about upholding freedom of thought, freedom of expression and non-discrimination in general. The EU has always been a secular construction per se and we commend that. It now has to translate this ambition into real action and fight discrimination an all grounds in and outside the EU. This includes taking action to defend all those who are discriminated worldwide for their thoughts and beliefs, whether religious or not. , said Michael Bauer, Chief Executive of the Humanistischer Verband Bayern and Vice-President of the European Humanist Federation. Beyond focusing on respect for human rights, respecting people’s human dignity also entails taking drastic action to reduce inequalities in Europe. Macro-economic indicators show positive trends but fail to translate the complex realities in which many citizens live today. If we keep ignoring these trends, populists and extremists will keep getting stronger. , said Martine Cerf, Secretary General of EGALE, a French member organisation of the EHF. Looking for “another take on Europe” is not enough. Between corrupt national parties often blaming Europe and European party families unwilling to take serious action against their national member parties, no wonder that the millions of citizens in risk of poverty and social exclusion feel left aside. This is why the EU should reinforce social dialogue and implement the priorities of the European Social Pillar, while enhancing participative democracy in the form of a formalized civil dialogue between EU institutions and civil society. Furthermore, we need to bring more coherence in the way we equip our citizens in terms of critical thinking and key competences. In a context of growing diversity in our societies, secularism is more important than ever to cater for the co-existence of the many life stances and world views present in public debate. For more information on the EHF’s proposals for a #HumanistEurope, please read our memorandum for the European elections.